Welcome to Sedona Ridge Apartments, the premier apartments in Dallas, Texas. We are a beautifully landscaped gated community that offers studio, one and two-bedroom apartment homes. As a resident of Sedona Ridge, you will have a generous selection of amenities, such as two shimmering swimming pools, wood burning fireplaces, a fully-equipped kitchen, and more. 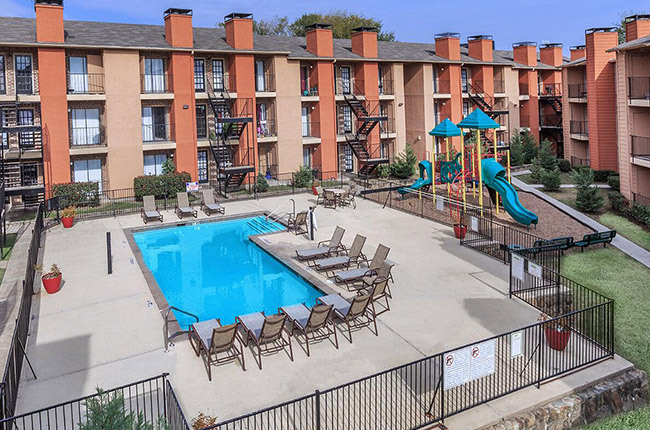 You also have the convenience of being located to nearby parks, shopping centers, and Freeway 635. We want families to feel welcome, which is why our family-friendly community features a picnic area with a barbecue grill and play area for children that families can enjoy. We are also a pet friendly community that welcomes pets. By living in our community, you will be able to enjoy the feeling of comfort, affordable living, and convenience. We truly believe that Sedona Ridge is the place for you to call home! Sedona Ridge is located in the Lake Highlands neighborhood of Dallas, Texas. By living at Sedona Ridge, you have easy access to Freeway 635 and many locations for entertainment, shopping, and dining. Grocery shopping could not be more convenient while living at Sedona Ridge. You can handle all of your grocery needs at one of the four nearby grocery stores, which include Kroger and Minyard Sun Fresh Market. However, if you want to do a mixture of shopping and grocery shopping in one stop you can go to NorthPark Center or Skillman Village Shopping Center. If you prefer a night out indulging in delicious food, you are minutes away from Big Mama’s Chicken and Waffles, The Garland Grill, Waffle House, and Zalo Thai Cuisine & Sushi Bar. Are you seeking something family-friendly to do? You are minutes away from Samuel-Garden Park, White Rock Creek Greenbelt, and the Dallas Arboretum and Botanical Garden. We want you to experience the pleasure of convenient living at Sedona Ridge!